Trading on the Trinidad & Tobago Stock Exchange remained subdued on Monday and resulted in 17 securities changing hands, compared to 13 on Friday. Advancing stocks just edged out declining ones at the close. 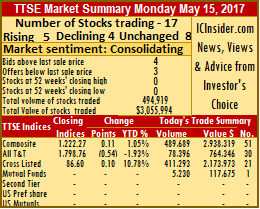 The market closed with 5 stocks advancing, 4 declining and 8 unchanged as 494,919 shares traded at a value of $3,055,994 compared to Friday’s 296,692 shares valued at $2,461,941. The Composite Index added 0.11 points to 1,222.27, the All T&T Index declined 0.54 points to 1,798.76 and the Cross Listed Index gained 0.10 points to close at 86.60. Gains| Grace Kennedy gained 2 cents to close at $2.79 trading 7,175 shares, Guardian Holdings advanced 10 cents, closing at $15.75 while exchanging 5,760 shares, JMMB Group added 1 cent, to end at $1.28 with 112,243 shares changing hands, Massy Holdings closed at $51.48, with gains of 3 cents trading 2,496 shares and Unilever Caribbean closed at $53.51, gaining 1 cent exchanging just 36 shares. 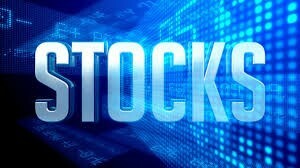 Losses| Ansa McAL closed at $66.39, losing 11 cents with a mere exchange of 40 shares, Clico Investment traded at $22.50, losing 1 cent with 5,230 shares changing hands, National Flour Mills lost 1 cent to close at $2.47 trading 210 shares, and Sagicor Financial closed at $9.01, with a loss of 7 cents exchanging 168,291 shares valued at $1,517,184. Firm Trades| First Citizens traded 2,210 shares at $32, National Enterprises closed at $10.53 exchanging 17,645 shares, NCB Financial Group closed at $3.99, with 123,584 shares valued at $493,100 changing owners, Point Lisas exchanged 20,000 shares at $3.88. Republic Financial Holdings traded only 17 shares at $101.85, Scotiabank closed at $58, with 932 shares changing hands, Trinidad & Tobago NGL exchanged 1,610 shares at $22 and Trinidad Cement traded 27,440 shares at $4.20.